If you’ve watched videos on YouTube or Hulu you’ve probably noticed one thing in common: there’s usually a commercial between you and the content you want to watch. A television show is a great way to give users a positive experience before literally funneling them through a series of commercials, akin to the “exit through the gift shop” strategy museums use. Although the top of your marketing funnel is probably not a hit sitcom or VanGogh exhibit, it’s important to understand the importance of the marketing funnel and how to best use this tool for your business goals. Continue reading or jump to our infographic featuring tips for the mobile marketer. A marketing funnel, also referred to as a purchase or sales funnel, is a model that breaks down the stages of the customer journey. It begins with general awareness and ends with leads converting into customers. While the exact number of stages can vary from industry to industry, they all represent the same process: awareness, consideration, conversion, and retention. While the stages of the marketing funnel might look different for every marketing and sales team, there is a similar goal at the end of every campaign: potential customers take action. Whether it’s making a purchase, signing up for product updates, or registering for a free trial, you are looking to make a conversion. The original model developed by Lewis consisted of four stages: awareness, interest, desire, and action (also referred to as the AIDA model). These stages have evolved slightly over time to reflect modern markets, but many still reference Lewis’ original model as the go-to concept. In the awareness stage, mobile marketers deploy tactics to draw attention to their business, product, or brand. These tactics can include social media advertising, referral marketing, email marketing, and many more strategies to promote mobile apps. While Lewis’ traditional, linear marketing funnel has been effective for marketers and salespeople for over a century and is still used today, the traditional funnel wasn’t designed to reflect mobile marketing efforts. The layout and stages look similar between the traditional funnel and the mobile marketing funnel, but the tactics used to move a customer through those stages will be drastically different. Regardless of what your marketing funnel looks like, it must begin with an exposure and awareness stage. Until consumers become aware of your brand or product, the other stages are irrelevant. There are a variety of strategies that mobile marketers can utilize to develop awareness — most commonly these tactics include content marketing, social media, paid advertising, and organic search. These methods allow you to easily share content with potential customers and help expose them to your value proposition. As the mobile landscape continues to evolve, there exists a greater opportunity for reaching your target audience. Marketing teams can also focus efforts on paid strategies, such as pay per click advertising, where you are only charged when a user has taken a particular action to view your site. Similar to the exposure and awareness stage, this second stage of the mobile marketing funnel is focused on providing leads with trusted content to guide their decision. Consumers will look for trust signals such as app ratings, reviews, and other social proof to help them throughout the consideration stage. The top app stores are trusted sources for this consideration stage. According to Statista, there were a total of 97 billion app downloads made in 2017, but 85% of people won’t download an app that has a 2-star or less rating on the app store. 4 Mobile teams must ensure that their app listing is well-optimized to highlight strong reviews and entice users to download. Potential customers are aware of your company or offering, but now consumers are doing their due diligence and making the final decision if they should move forward with your product or a competitor. Often, the power of persuasion here is in the hands of previous customers through reviews and ratings, which is why user experience must be emphasized. This is the stage in which consumers and your specific leads make the decision to take action. During this stage of the mobile marketing funnel, you want to make the process as seamless as possible. Anything that you do to remove friction, such as additional clicks, forms, or account creation processes will help prevent your leads from bouncing. Once you’ve generated a conversion, you might think it’s time to go back to the drawing board and start the hunt for the next conversion. Not quite. Marketers need to continue providing value for customers beyond the initial sale. Although a first impression has been established, there is still a hill to climb and a chasm to cross before long-term trust is established. 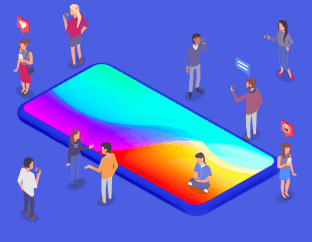 Mobile marketers can utilize personalized in-app messaging, push notifications, and consistent product updates that are valuable to the user to help develop a positive and lasting relationship. The quality of your customer service also goes a long way in building that strong relationship. You don’t want customers to buy a product once, or use your app once, or visit your store once; you want them to become long-term customers or users who stay loyal to your brand. This final stage of the mobile marketing funnel goes hand-in-hand with building customer relationships. If you’ve built a positive customer relationship, your customers are more likely to stay engaged. Within the retention stage, customers become advocates for your company or product. As they continue their journey as a repeat customer, they are much more likely to tell their friends about your offering, therefore generating meaningful referrals. To aid with user retention, be sure to update your in-app content regularly so that users stay engaged and their overall UX continues to improve. Loyalty programs and push notifications are also recommended tactics for mobile app teams for keeping audiences’ experience fresh. 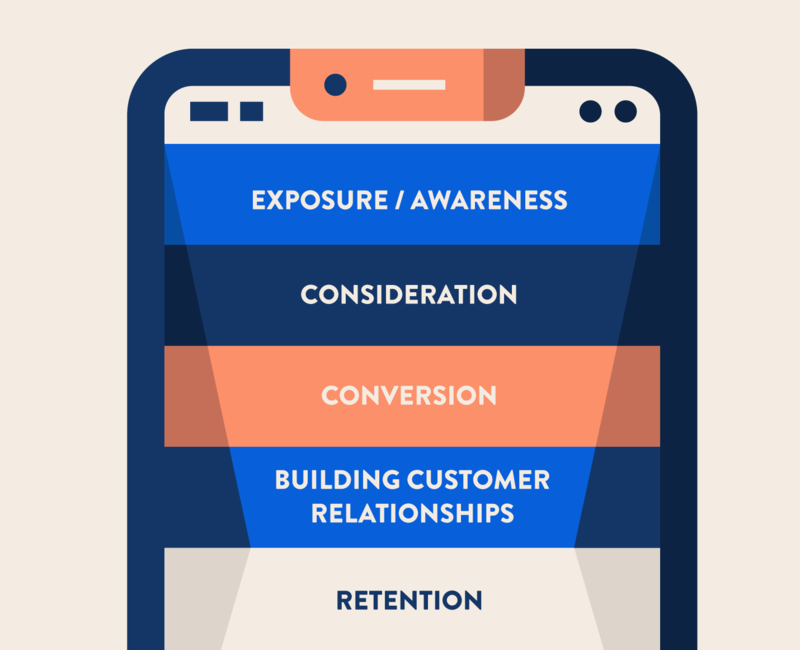 Why Is The Mobile Marketing Funnel Important? When it comes to marketing efforts, the goals have not changed for centuries. The role of both advertising and marketing is to get potential leads to convert, and the mobile marketing funnel intends to guide this process. The rise of social media and new mobile technologies have given brands and companies powerful new channels for reaching potential customers. By understanding the strategies and tactics of the mobile marketing funnel, organizations have the rare opportunity to stay competitive in saturated industries. It’s important for mobile marketers to be aware of how the user journey map correlates to the mobile marketing funnel. With channels like social media and online reviews available at the fingertips of consumers, it’s possible they may not even enter from the top of the funnel. Leads can enter mid-funnel and expedite the standard conversion journey. Regardless of where users enter the funnel, an effective onboarding process is essential if you want to retain users. It is not a one-size-fits-all system, and marketers have to be nimble and ready to engage leads with a myriad of tactics.